Count me as one whose interest in the NBA has waned in recent years, and it's their fault. It's almost here. 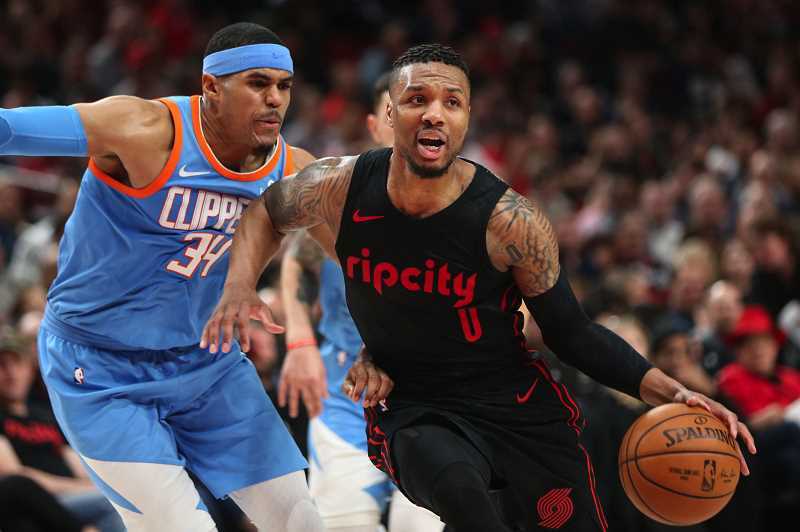 The Portland Trail Blazers kick off their 49th season this Thursday night, Oct. 18, against LeBron James and the Los Angeles Lakers at the Moda Center at 7:30 p.m.
On the edge of your proverbial seat? Or champing at the bit for a shot at the franchise's second world championship in almost 50 years? If so, more power to you, but while you're holding out hope for something akin to the Tooth Fairy, Santa Claus or the Easter Bunny delivering money, gifts or candy personally to your doorstep, I'll be watching playoff baseball or the type of exciting high school, college or pro football action we saw nearly all last weekend. Yes, I'm jaded. I make no bones about my disdain for this generation's NBA. This is a league no longer about competition, but rather entertainment for people more interested in players than the teams they represent. While you or I may be curious about the ongoings of our local franchise, many of today's NBA fans are acclimating themselves to the latest team that their favorite player jumped to during last summer's offseason. Many of the same people who rooted for Miami five years ago and Cleveland over the past four seasons have or are saving to purchase a LeBron James Los Angeles Lakers jersey, a Showtime T-shirt, and a downloaded version of Randy Newman's "I Love L.A." The same could be said for the Golden State Warriors fans either before or after Kevin Durant's arrival, and Houston Rockets fans who couldn't have found Houston on a map five years ago. Like seemingly everything in today's culture, the NBA has become tribal and today's tribes are about me, myself and I — nothing else. I'd be lying if I said I weren't at all interested. Sure, as a sports fan, ultimately, I can't quit sports. I'll follow the action in the box scores, listen to my local and national sports talk radio batter back and forth the NBA topics of the day, and yes, I will likely tune in for at least a bit of Thursday's game against the Los Angeles LeBrons. But I'll do so with at least one of my fingers on the remote's recall button, destination unknown. Why? Because Portland can't win. The NBA is the most predictable of all the professional sports leagues. Over the last 40 years, only 11 different franchises have won NBA titles. To the contrary, in that same time span, 18 different teams have won Super Bowls, 21 teams have won the World Series, and for good measure, 17 teams have hoisted the Stanley Cup. The league caters to stars, and stars win in the National Basketball Association. It's bad enough that I can likely predict 90 percent of this coming year's NBA playoff teams, but I can also likely predict the league's final four, and barring a handful of catastrophic injuries, the two finalists and the eventual winner. Not for this guy, and not for anyone who is a fan of legitimate competition. I like Damian Lillard, CJ McCollum and the bulk of this Trail Blazer squad, and at my core I'll root for them to win. But they're the real victims here, because the league has made them and about 28 other teams the Washington Generals, in favor of the three or four Globetrotters we know will almost always win. So to answer my own aforementioned questions: I'm not psyched, on the edge of my proverbial seat or champing at the bit. Maybe that's a "me" problem, but in today's world, I think those are the only ones that count.